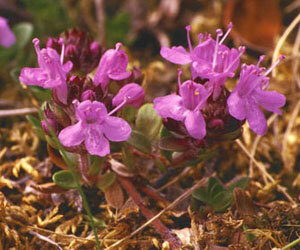 Thyme - is a perennial creeping plant of the Deadnettle family. It has a wide distribution area. It grows in Asia, Russia, Ukraine and the territory adjacent to their states. The essential oil is extracted from the aboveground part of the plant where it contains about 1 percent. The oil consists of the thymol and carvacrol that are natural antibiotics. Essential oil of thyme has pronounced antiseptic properties. It is used to treat a wide range of diseases. Namely: respiratory diseases (SARS, tuberculosis, whooping cough, asthma, etc. ), rheumatism, infectious diseases of the gastrointestinal tract and urinary tract. It also is effective in the treatment of dermatoses of various etiologies, scabies and acne. It has a stimulating effect on the central nervous system, therefore the thyme is used in treating drug and alcohol addiction. In folk medicine, infusion of thyme is taken orally to stop vomiting because it normalizes the pancreas and increases the secretion of gastric juice. It also is effective for infusion of thyme common digestive disorders and flatulence. Dried and grinded thyme (its grassy part) sprinkled external wounds and poorly healing ulcers. Besides medicinal properties the thyme has gastronomic value. So, fresh thyme is used in cooking different salads, dried is made into a tea. In addition, thyme as a seasoning, adds to the meat, poultry, fish dishes and sauces. There is also honey from thyme. Those who have tried it at least once thyme’s honey, will remember its rich taste and strongly marked aroma. By the way, in the treatment of colds, such honey allows to combine helpful with pleasure. On the one hand it is a delicate sweetness, and on the other – is an effective medicine. Pleasant aroma of essential oil of thyme for use in the sweating-room, will allow you to disinfect the throat and get a charge of vivacity for a long time.